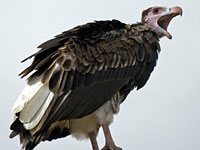 What does a vulture look like? Vultures, as part of the group known as birds of prey, have acute eyesight, muscular legs and sharp bills. King vultures have a very colorful look that distinguishes them from their vulture relatives. They are predominately white, with black tails and wing tips. They have piercing, often straw-colored eyes and multicolored (yellow, orange, and red) heads and necks. Though brightly colored, the vulture's head and neck are bald. This may help the fastidious birds to stay clean, and ensure that bacteria-laden animal remains don't fester in the bird's plumage where they could spread disease. 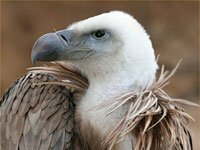 The Old World vultures of Africa, Asia and Europe are not closely related to the New World vultures of the Americas. These birds are collectively called vultures because they look similar and fill the same ecological niche. King vultures are found from Mexico south to Argentina. Some suggest that the bird's name stems from an old Mayan legend in which this vulture was a "king" or "lord" that carried messages between humans and the Gods. What does a vulture eat? 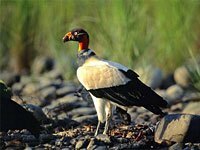 Like other vultures, the king vulture is a scavenger. These large birds glide on air currents, conserving energy while searching the forests or savanna below for the corpses of dead animals. When a particularly good prize is discovered, it is not uncommon to find up to six different species of vulture taking part in the feeding frenzy. Because of their unappetizing eating habits, they fill an ecological niche, and may help to prevent the spread of disease by disposing of rotting remains. Did you know this about vultures? 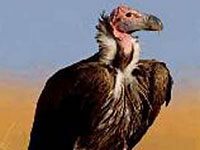 Vultures have developed incredile eyesight in order to spot their food. 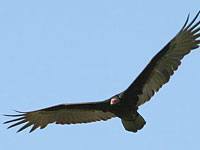 A soaring vulture can spot a 3-foot animal carcass from up to 4 miles away. The Ruppell's vulture is the world's highest flying bird. In 1973, one collided with an airplane off the Ivory Coast; at the time, the plane was flying at 37,000 feet. Download free Vulture wallpapers, click on the image to open the large version. Print free Vulture coloring pages, click on the image to open the large version.